Why Are Liberals Such Racists? As a conservative, I essentially never encounter racism. I don’t have any racist friends or acquaintances. The issue never comes up. Liberals, on the other hand, tell us that they are swimming in a sea of racism. I don’t know, they might be right. Maybe in their liberal world, racism is still an issue. 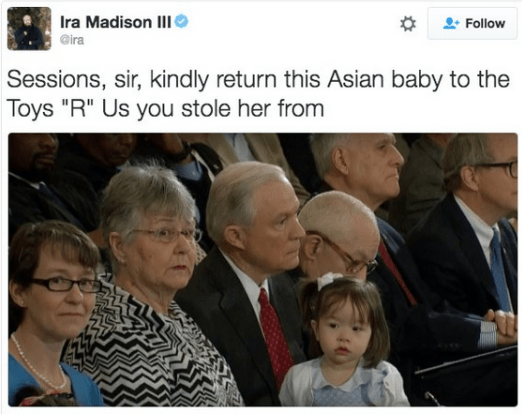 The girl is, of course, Sessions’s granddaughter. Madison, a liberal, likely a person of less than average intelligence, subsequently deleted his tweet. But what is it with liberals and racism? Remember when liberals tried to make some kind of scandal out of the fact that one of Mitt Romney’s grandchildren was African-American? What is wrong with these people? This kind of thing happens a lot. If you are looking for racism, look to the left. The moral of the story is that, while most people think liberals are just ignorant, the truth is much worse.